1. 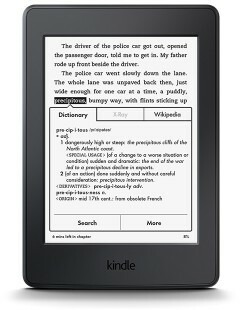 The sharper definition of the type, much clearer than the display of my older Kindle: it’s easier on the eyes, and I need that. 2. The ability to change typeface, line-spacing, and margins to suit the way I like to read: I immediately changed my font to Palatino, which is clean and elegant and an old favorite. In the first book I started on this Kindle, I did not change the line-spacing, but I thought of ebooks I’ve read with too much space between lines and paragraphs. I think that makes for harder reading. 3. The case feels as smooth and pleasant to the touch as a piece of art, like metal suede, and the device weighs less than my old Kindle. I like its shape, too. 4. The Paperwhite seems easier to navigate than the Kindle Touch. My husband has one of those, and I’ve never gotten used to it. I needed only a few graphic instructions to start using the Paperwhite. I haven’t yet tried the dictionary function, shown in the illustration, but it looks more advanced than my old system, and swiping to underline is going to be faster and easier than the older method of clicking and dragging. Accessories I did not buy: a power adapter. I figured my old one would work, and it does. I also did not buy a cover, and I like the feel of the Paperwhite so much I’m glad I didn’t. I have a leather pouch that’s the perfect size to protect it when I want to carry it in my purse. A cloth bag or large envelope would work as well. I hope now I’ll be able to read more books. Currently I’m sampling Erik Larson’s Dead Wake: The last crossing of the Lusitania. Normally I would not be attracted to such a title, thinking (stupidly) that I know all I want to know about that event. Of course I don’t, and I enjoy how Larson makes nonfiction as compelling as fiction. His Devil in the White City remains one of my favorite books. I have a print copy of that book, should any of my (nearby) friends like to borrow it.